This week's travel post is a continuation of our May vacation to Colorado. If you need to start at the beginning, go HERE. You can also click on Blog Archive in my side bar to see my previous travel posts. On Day Four of our Adventure to Colorado, we had planned on seeing a glacier, so I picked a hotel that on the map looked very close to that glacier, but in reality it was quite a distance away because there was a mountain in the way. Surprise! Mountains in Colorado! Who would have thought. Well, we decided not to drive to the glacier because of the distance, and we already had enough snow and ice in one trip anyway (Rocky Mountain National Park), BUT, our hotel was non-refundable, so we had to stay there. Thus, the morning of Day Four, we decided to just hit the road and head for our hotel with absolutely no idea of what we were going to do that day. About an hour into our drive, my husband saw the Golden exit signs and asked if I wanted to stop and take a look. I was ready to relieve myself of my morning coffee by now anyway, so I said "Why Not!". 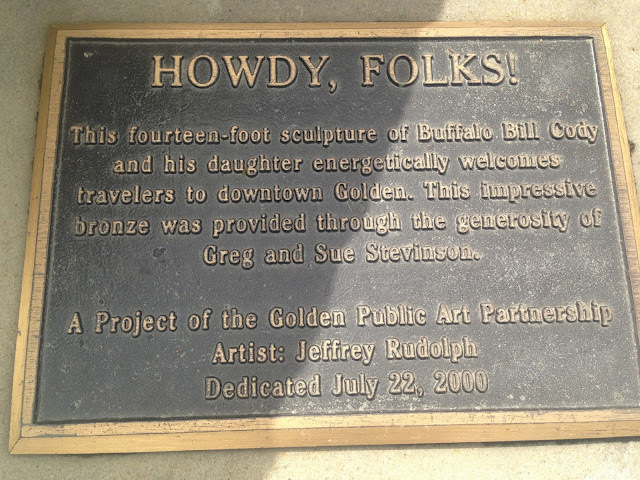 Now, I have never heard of Golden, Colorado in my entire life. But apparently it is a well known town for it is where they produce Coors Beer and it is also the location of the Colorado School of Mines. But for me, it was a delightful little gem that I discovered all on my own. This is one of the cutest littlest towns I have ever seen. When you exit the freeway and enter the town these beautiful Golden Arch signs welcome you. 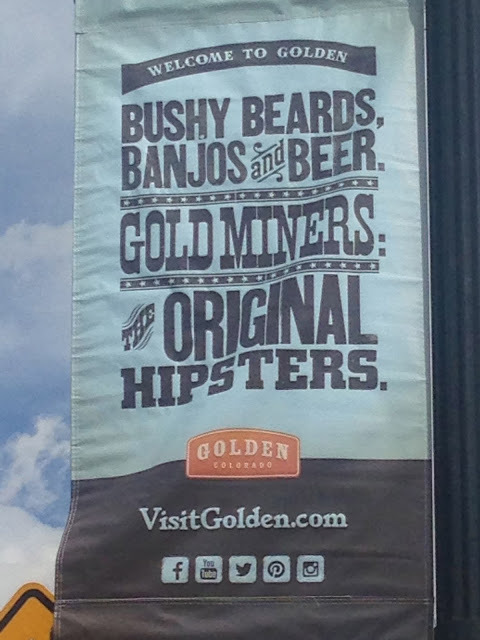 The town is proud of it's gold mining past, and that is evident in all it's wild west slogans, advertisements, and decor. Many bronze statues are scattered about town, like the buffalo above, and the Buffalo Bill statue below which greets people as they arrive in town. You have to cross this beautiful bridge to get into the downtown area. The town lies along Clear Creek at the base of the foothills of the Rocky Mountains. They have picnic table set up on this bridge to enjoy the view of the creek and mountains. View of the Coors Brewery from the bridge. Our first stop was the Golden Visitors Center to use the potty and to see what there was to do in this sweet little town. Here we found out about all the fun shops in town, a river walk, look-out mountain, and a scenic drive we could take. 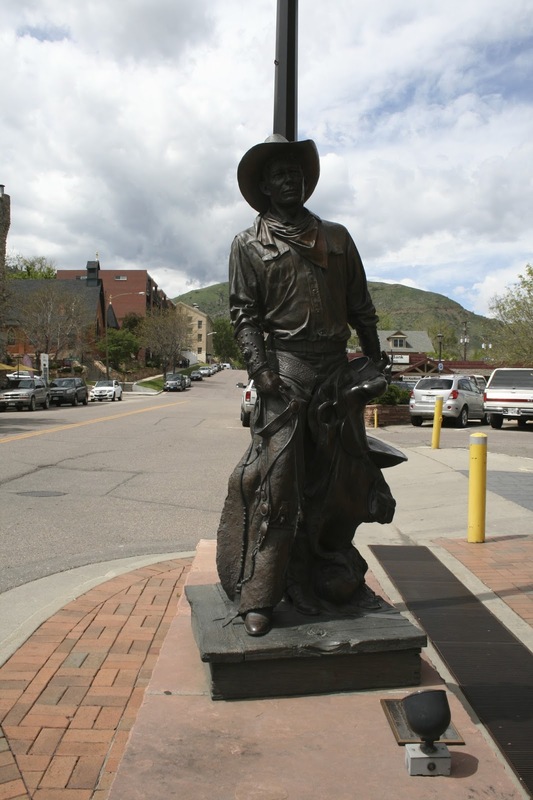 There are over thirty bronze statues located throughout the city of Golden. The sleeping bear is located right in front of the visitor's center. 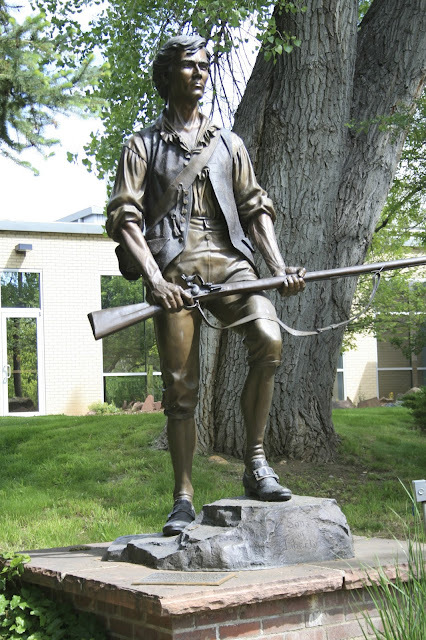 And the "Sons of Liberty" is located on the Clear Creek Trail. If you'd like to see more of these beautiful statues, go HERE. Because we were in Golden before the stores opened, we decided to walk along the Clear Creek Trail for awhile. This is a beautiful, 24 mile trail that links to neighboring communities, but we only hiked on it for a short distance. While hiking we encountered the Search and Rescue Team doing a drill. It was fun to watch them float in the cold, flooded waters. While strolling on the trail, we discovered Clear Creek History Park. It is a free attraction that shows how the early settlers in the late 1800's lived. There is a mountain ranch house complete with gardens and a root cellar (pictured below), blacksmith shop, chicken coop, and school. You can't go inside the buildings, but you can peek through all the windows. The inside is decorated with antiques showing how the people lived back then. We were surprised to see they had live chickens at their chicken coop. Being that both my children are musicians, this was my favorite bronze statue in Golden. It is located right next to the creek behind a performing arts stage. A beautiful view of the creek with the Colorado School of Mines emblem on the mountaintop. By now, it was time for lunch and we found this amazing restaurant 'Woody's Wood Fired Pizza'. Would you believe this place has an all-you-can-eat wood-fire pizza buffet for only $11.99? My husband thought he had died and went to heaven. I mean, pizza buffets, yes, there's a lot of those. But not wood-fire pizza buffets! Wood-fire pizzas are usually very expensive, costing $25.00 for just one large pizza! Of course, we had to eat here! 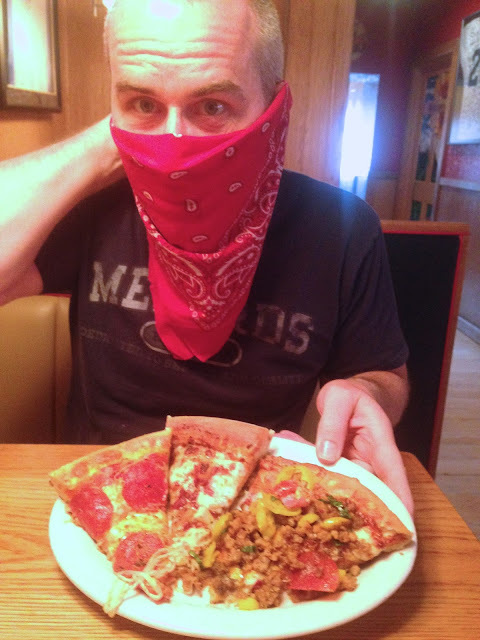 They used bandannas for napkins and my husband had to have a little fun with them! The pizza was amazing, and the fact that it was a buffet was a plus because we could try so many different flavors! We absolutely loved the place! It had a really fun sports decor, and the owner even came over to our table to chat with us a bit. Because of all the jerseys displayed, my husband immediately started talking about sports with him. We had such a wonderful time there. After we ate, we decided to walk along main street and visit some stores. We found this wood carving for sale outside a store on main street. 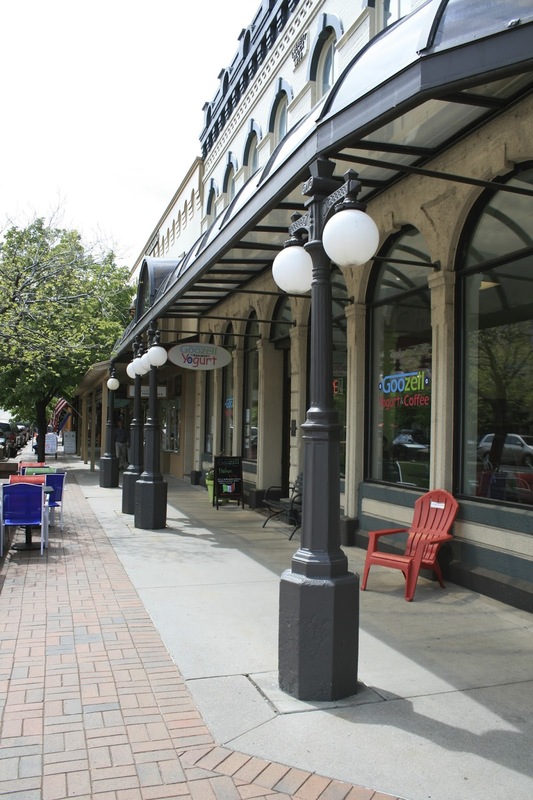 We loved all the historic buildings and western motifs lining the street. This is a new hotel at the end of main street. We thought the adobe architecture was very interesting. 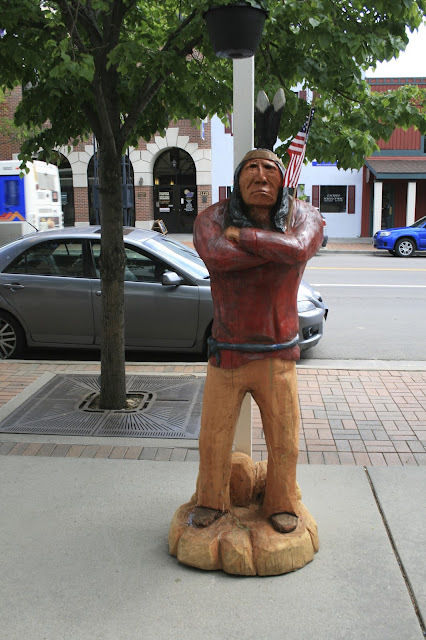 Another bronze statue called 'The Cowboy'. This unique rock formation is visible from many areas of Golden. We thought it was so interesting and cool looking. And finally, a view of Golden from the opposite end. Such a pretty town. Sometimes, it is the unplanned activities on vacations that end up being the most fun. This was one of those times. 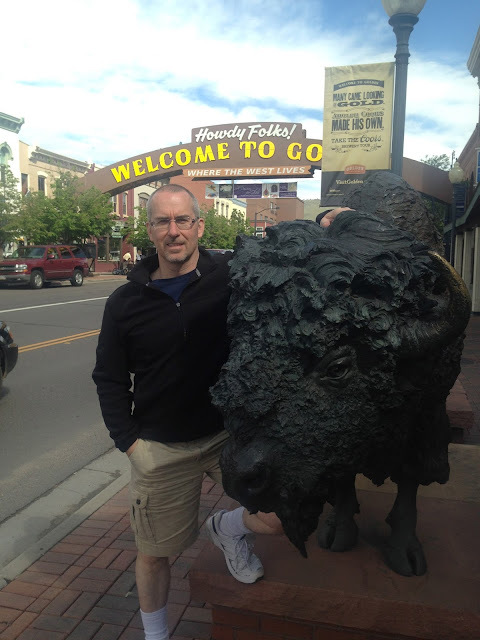 We really enjoyed are unplanned stop at Golden, and it ended up being one of our favorite memories of our trip. But we weren't quite finished with Golden yet, because my husband insisted we drive up one more harrowing mountain top road: LookOut Mountain! More on that next week. Wow I so want to go to Colorado some day!! These pictures are awesome and it looks like you had a great time!